Tony Peterson sang and played bassoon and clarinet in his childhood. He became interested in early music while completing his PhD in physics at the University of Arizona. 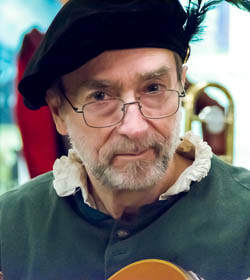 Today he directs the Los Grillos consort, plays recorder, crumhorn, cornemuse, racket, shawm, dulcian, cornetto, sackbut, drums, hurdy gurdy, and sings bass and occasionally tenor. Heather Peterson first fell in love with Gregorian chant while growing up in the Midwest near Chicago. She studied chant and early music as an undergraduate at Benedictine College in Illinois where she majored in voice. She loves to sing and plays a wide variety of early instruments including Gothic harp. Ron Mann took piano lessons for 5 years as a child, then choir, chamber choir, and Madrigal singers through junior high and high school along with musicals in drama club. Currently sing Tenor with the Intel Singers choir, sing, act and pretend to play an instrument or two with Los Grillos (when I’m not working or raising/training/showing Cocker Spaniels with my beautiful wife Dianna!). Growing up, Susy Wilcox dabbled in clarinet, piano and guitar until she discovered recorder and sackbut later in life. She searched the country for sackbut players and finally moved from Denver to Portland where she found a collection of like-minded folks. There she found it necessary to take up the racket as well to keep up with local customs. Happily all these musical threads combine in Los Grillos. 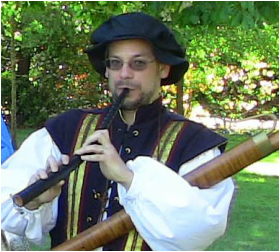 An accomplished Navy musician, David was introduced to the Society for Creative Anachronism while stationed in Charleston, rekindling his relationship with the recorder and early music. In the SCA he is known as Lord Dorian Longwind of Neumes, a minor musician of note, performing on recorders of all sizes, krumhorns, 'sackbut', and lots of percussion, including doumbek, frame drums and assorted toys. He currently drives a Tri-Met bus by day, and uses his B.A. degree in music composition to good use at night, composing and arranging songs when he is not in rehearsal. TX, where he played with the University of Texas Early Music Ensemble and later Texas Early Music Project, under director Daniel Johnson, on lute, recorder and percussion. He moved to Portland in 2012, and is retired from a 40-year career in software development. When he's not making music with Los Grillos he enjoys continuing to dabble in software, walking/hiking, reading and photography. Ramya has been trained in Indian classical singing. She continued music lessons after moving to Portland and took up Piano lessons for a year which helped in reading western notes. 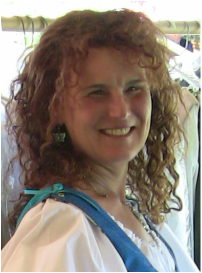 She joined Los Grillos a year ago and has been learning Alto recorder along with alto singing . Los Grillos is a wonderful addition to her music journey! Angela Derr spent grade school and high school singing Alto, and sometimes Soprano, in Show Choir, Women’s Choir, and Concert Choir. Through college sang with MATC Community Show Choir and Madrigals, followed by many wonderful years singing major choral works with the University of Wisconsin Choral Union, where her love of early music was solidified. Now she enjoys singing anywhere from Tenor to Soprano with this band of merry bards. Having played trombone from a young age, Erika Richter took up the sackbut shortly after moving to Portland from Cleveland, OH in 2016. While still a brass player at heart, she can be seen playing many other instruments with Los Grillos including crumhorn, cornamuse, and recorder. 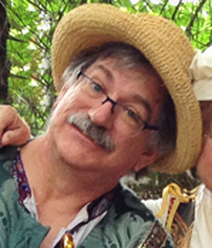 Gerry Leatherman managed to make his way into adulthood with the help of piano and clarinet lessons, recorder duets with his dad, singing in school choirs, and playing folk music on the guitar. As an adult, playing classical and baroque music on the piano helped him get through the week as an engineer at Intel. Gerry discovered renaissance music only recently, and now enjoys playing recorder, crumhorn and sometimes singing with Los Grillos. Gerry also regularly leads hymn singing and accompanies on guitar or piano at church, and is currently pursuing a side career as a recorder maker. Ken Russell played clarinet, saxophone, and piano in school. He took up the recorder as an adult after hearing a recording of renaissance music on period instruments. 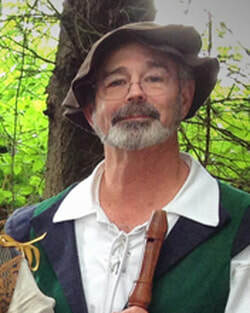 Ken participated in the recorder program at Santa Monica College, which led to attendance at renaissance music workshops. He now plays recorder, cornamuse, crumhorn, racket, and is studying the sackbut.